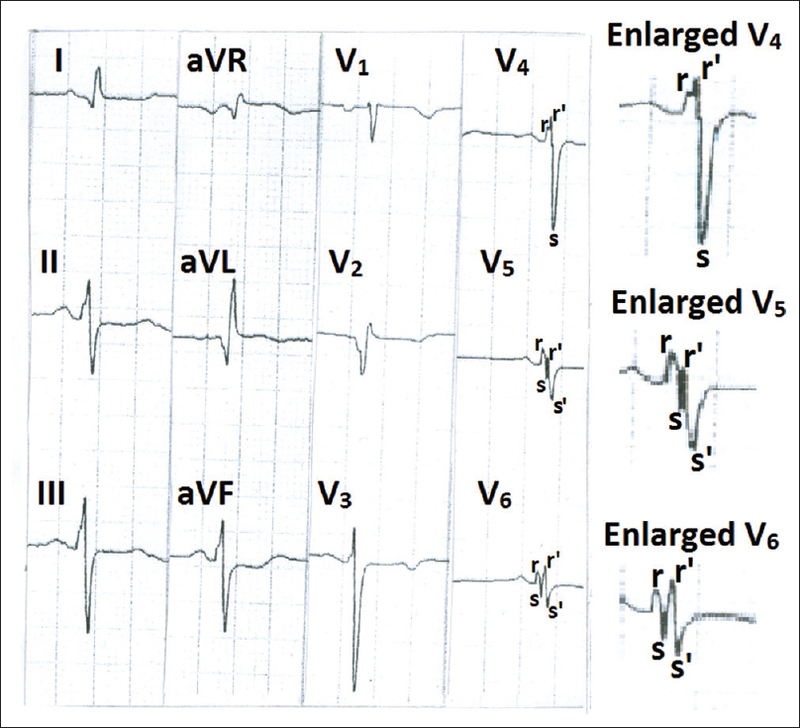 Fragmented QRS is defined as the presence of R' wave or notching of R or S wave in the presence of narrow QRS. It indicates heterogeneous depolarization of the ventricular myocardium that can occur due to ischemia, fibrosis, or scar. It may also be a marker of coronary microvascular dysfunction. In the context of epicardial coronary artery disease, it is associated with multivessel disease and greater incidence of cardiac events. It has been shown to be an indicator of higher incidence of arrhythmias and sudden death in arrhythmic right ventricular dysplasia, Brugada syndrome, and acquired long QT syndrome. Its regression following cardiac resynchronization therapy suggests electrical reverse remodeling. It has also been shown to be a marker of myocardial involvement in congenital heart diseases and is helpful in diagnosing subclinical cardiac involvement in various systemic diseases. Evaluation of prognosis of a patient with cardiovascular disease frequently requires invasive evaluation. Recently, it has been shown that the presence of fragmented QRS (fQRS) on a routine twelve-lead surface electrocardiogram (ECG) can give a reasonable impression about the severity of cardiac involvement in various cardiac and systemic diseases. The present article aims to review the latest information in this field. fQRS is defined as the presence of an additional R wave (R') or notching of R or S wave or the presence of more than one R' in two contiguous leads corresponding to a major coronary artery. 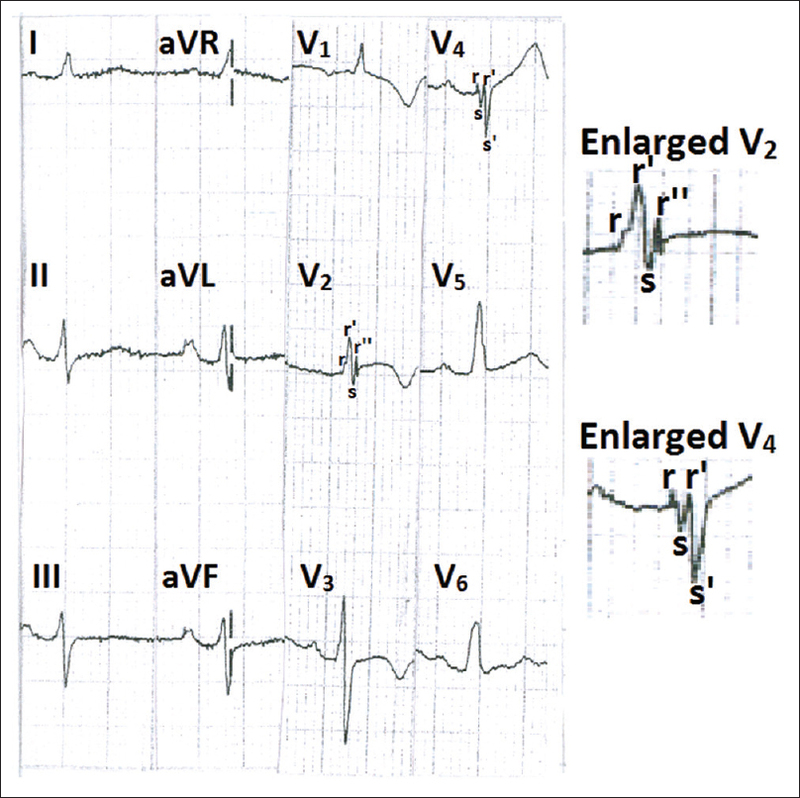 It is necessary that QRS should be narrow (<80 ms) and must not fit into any classical bundle branch block pattern. Representative tracings are shown in [Figure 1] [Figure 2] [Figure 3]. In the presence of a wide complex QRS (>120 ms), more than two notches in the R or S wave in two or more contiguous leads are necessary to qualify as fQRS. Contiguous leads mean anterior leads (V 1 -V 5 ), lateral leads (I, aVL, and V 6 ), or inferior leads (II, III, and aVF). fQRS suggests heterogeneous depolarization of ventricular myocardium that can occur due to ischemia, fibrosis, or scar. Channel dysfunction can be responsible for heterogeneous depolarization in some cases. fQRS can occur in primary cardiac pathologies or cardiac involvement in systemic diseases. In hypertrophic cardiomyopathy, fQRS is a marker of myocardial fibrosis,  and its sensitivity and diagnostic accuracy for detecting myocardial fibrosis are substantially higher than the pathological Q-waves. fQRS is also associated with a higher rate of hospitalization for heart failure  and a higher risk of sudden death  in these patients. Yang et al. observed that regression of fQRS following cardiac resynchronization therapy (CRT) correlated with an improvement in the left ventricular ejection fraction or the New York Heart Association functional class and an improvement in survival without heart failure hospitalization. These authors concluded that regression of fQRS could be a marker of electric reverse remodeling following CRT. Celikyurt et al. have also observed that resolution of fQRS is associated with response to CRT. fQRS suggests cardiac involvement in patients with sarcoidosis,  systemic lupus erythematosus,  rheumatoid arthritis,  systemic sclerosis,  Familial Mediterranean fever,  iron overload in beta-thalassemia major,  obstructive sleep apnea,  and metabolic syndrome. However, in view of the small number of patients with these disease conditions in most series, the exact clinical significance of fQRS cannot be determined. 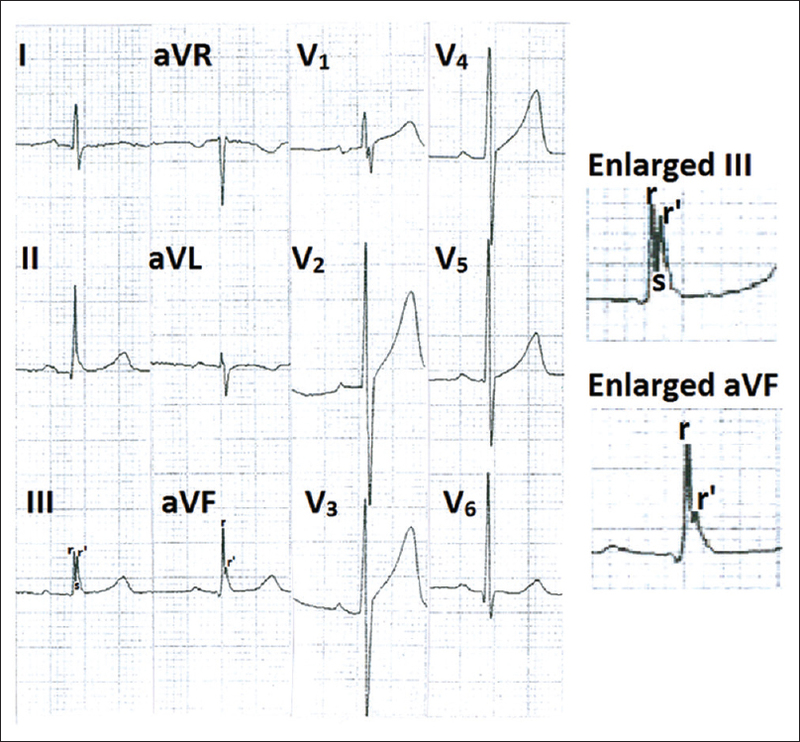 The presence of fQRS on conventional ECG is helpful in suspecting cardiac involvement in various systemic disorders. In cardiac diseases, it correlates with subclinical left ventricular dysfunction or scarring and predicts a higher incidence of ventricular arrhythmias. However, this ECG finding needs to be interpreted in total clinical context. Its presence in anterior precordial leads (V 1 to V 5 ) and lateral leads (I, aVL, and V 6 ) is more specific than its presence only in the inferior leads. Accurate recording needs optimal low pass filter setting in the ECG machine. It has a low specificity but higher sensitivity and negative predictive value compared with Q-wave for a myocardial scar. Sensitivity is increased when the two signs are combined. Jain R, Singh R, Yamini S, Das MK. Fragmented ECG as a risk marker in cardiovascular diseases. Curr Cardiol Rev 2014;10:277-86. Steger A, Sinnecker D, Berkefeld A, Müller A, Gebhardt J, Dommasch M, et al. Fragmented QRS. Relevance in clinical practice. Herzschrittmacherther Elektrophysiol 2015;26:235-41. Yilmaz H, Gungor B, Kemaloglu T, Sayar N, Erer B, Yilmaz M, et al. The presence of fragmented QRS on 12-lead ECG in patients with coronary slow flow. Kardiol Pol 2014;72:14-9. Yan GH, Wang M, Yiu KH, Lau CP, Zhi G, Lee SW, et al. Subclinical left ventricular dysfunction revealed by circumferential 2D strain imaging in patients with coronary artery disease and fragmented QRS complex. Heart Rhythm 2012;9:928-35. Das MK, Michael MA, Suradi H, Peng J, Sinha A, Shen C, et al. Usefulness of fragmented QRS on a 12-lead electrocardiogram in acute coronary syndrome for predicting mortality. Am J Cardiol 2009;104:1631-7. Bekler A, Gazi E, Erbag G, Peker T, Barutçu A, Altun B, et al. Relationship between presence of fragmented QRS on 12-lead electrocardiogram on admission and long-term mortality in patients with non-ST elevated myocardial infarction. Turk Kardiyol Dern Ars 2014;42:726-32. Tanriverdi Z, Dursun H, Simsek MA, Unal B, Kozan O, Kaya D. The predictive value of fragmented QRS and QRS distortion for high-risk patients with STEMI and for the reperfusion success. Ann Noninvasive Electrocardiol 2015;20:578-85. Dursun H, Tanriverdi Z, Gul S, Colluoglu T, Kaya D. The usefulness of fQRS and QRS distortion for predicting reperfusion success and infarct-related artery patency in patients who underwent thrombolytic therapy. Coron Artery Dis 2015;26:692-8. Basaran Y, Tigen K, Karaahmet T, Isiklar I, Cevik C, Gurel E, et al. Fragmented QRS complexes are associated with cardiac fibrosis and significant intraventricular systolic dyssynchrony in nonischemic dilated cardiomyopathy patients with a narrow QRS interval. Echocardiography 2011;28:62-8. Sha J, Zhang S, Tang M, Chen K, Zhao X, Wang F. Fragmented QRS is associated with all-cause mortality and ventricular arrhythmias in patient with idiopathic dilated cardiomyopathy. Ann Noninvasive Electrocardiol 2011;16:270-5. Baranchuk A, Femenia F, López-Diez JC, Muratore C, Valentino M, Retyk E, et al. Fragmented surface ECG was a poor predictor of appropriate therapies in patients with Chagas' cardiomyopathy and ICD implantation (Fragmented ECG in CHAgas' Cardiomyopathy Study). Ann Noninvasive Electrocardiol 2014;19:43-9. Shimizu M, Nishizaki M, Yamawake N, Fujii H, Sakurada H, Isobe M, et al. J wave and fragmented QRS formation during the hyperacute phase in Takotsubo cardiomyopathy. Circ J 2014;78:943-9. Roukoz H, Shah M, Masilamani LJ, Thachil A, Jayakumar PK, Benditt DG, et al. fQRS as a marker of granulomatous disease in patients presenting with ventricular tachycardia and normal left ventricular ejection fraction. Indian Heart J 2015;67:222-6. Korkmaz L, Hatem E, Erkan H, Ata Korkmaz A, Dursun I. Fragmented QRS may predict increased arterial stiffness in asymptomatic hypertensive patients. Blood Press Monit 2015;20:16-9. Zhang B, Zhen Y, Shen D, Zhang G. Significance of fragmented QRS complexes for identifying left ventricular hypertrophy in patients with hypertension. Ann Noninvasive Electrocardiol 2015;20:175-80. Kadi H, Demir AK, Ceyhan K, Damar IH, Karaman K, Zorlu Ç. Association of fragmented QRS complexes on ECG with left ventricular diastolic function in hypertensive patients. Turk Kardiyol Dern Ars 2015;43:149-56. Pardo Mindán FJ, Panizo A. Alterations in the extracellular matrix of the myocardium in essential hypertension. Eur Heart J 1993;14 Suppl J:12-4. Açikgöz E, Yaman B, Açikgöz SK, Topal S, Tavil Y, Boyaci NB. Fragmented QRS can predict severity of aortic stenosis. Ann Noninvasive Electrocardiol 2015;20:37-42. Konno T, Hayashi K, Fujino N, Oka R, Nomura A, Nagata Y, et al. Electrocardiographic QRS fragmentation as a marker for myocardial fibrosis in hypertrophic cardiomyopathy. J Cardiovasc Electrophysiol 2015;26:1081-7. Nomura A, Konno T, Fujita T, Tanaka Y, Nagata Y, Tsuda T, et al. Fragmented QRS predicts heart failure progression in patients with hypertrophic cardiomyopathy. Circ J 2015;79:136-43. Zhang L, Mmagu O, Liu L, Li D, Fan Y, Baranchuk A, et al. Hypertrophic cardiomyopathy: Can the noninvasive diagnostic testing identify high risk patients? World J Cardiol 2014;6:764-70. Temiz A, Gazi E, Altun B, Güngör Ö, Barutçu A, Bekler A, et al. Fragmented QRS is associated with frequency of premature ventricular contractions in patients without overt cardiac disease. Anatol J Cardiol 2015;15:456-62. Temiz A, Gazi E, Güngör O, Altun B, Barutcu A, Bekler A, et al. Fragmented QRS and prediction of paroxysmal atrial fibrillation episodes. Pak J Med Sci 2014;30:862-7. Das MK, Maskoun W, Shen C, Michael MA, Suradi H, Desai M, et al. Fragmented QRS on twelve-lead electrocardiogram predicts arrhythmic events in patients with ischemic and nonischemic cardiomyopathy. Heart Rhythm 2010;7:74-80. Peters S, Trümmel M, Koehler B. QRS fragmentation in standard ECG as a diagnostic marker of arrhythmogenic right ventricular dysplasia-cardiomyopathy. Heart Rhythm 2008;5:1417-21. Morita H, Kusano KF, Miura D, Nagase S, Nakamura K, Morita ST, et al. Fragmented QRS as a marker of conduction abnormality and a predictor of prognosis of Brugada syndrome. Circulation 2008;118:1697-704. Priori SG, Gasparini M, Napolitano C, Della Bella P, Ottonelli AG, Sassone B, et al. Risk stratification in Brugada syndrome: Results of the PRELUDE (PRogrammed ELectrical stimUlation preDictive valuE) registry. J Am Coll Cardiol 2012;59:37-45. Haraoka K, Morita H, Saito Y, Toh N, Miyoshi T, Nishii N, et al. Fragmented QRS is associated with torsades de pointes in patients with acquired long QT syndrome. Heart Rhythm 2010;7:1808-14. Yang XW, Hua W, Wang J, Liu ZM, Ding LG, Chen KP, et al. Regression of fragmented QRS complex: A marker of electrical reverse remodeling in cardiac resynchronization therapy. Ann Noninvasive Electrocardiol 2015;20:18-27. Celikyurt U, Karauzum K, Sahin T, Agacdiken A, Vural A, Ural D. Association between resolution of fragmented QRS and response to cardiac resynchronization therapy. Ann Noninvasive Electrocardiol 2015;20:126-31. Terho HK, Tikkanen JT, Junttila JM, Anttonen O, Kenttä TV, Aro AL, et al. Prevalence and prognostic significance of fragmented QRS complex in middle-aged subjects with and without clinical or electrocardiographic evidence of cardiac disease. Am J Cardiol 2014;114:141-7. Park SJ, On YK, Kim JS, Park SW, Yang JH, Jun TG, et al. Relation of fragmented QRS complex to right ventricular fibrosis detected by late gadolinium enhancement cardiac magnetic resonance in adults with repaired tetralogy of Fallot. Am J Cardiol 2012;109:110-5. Egidy Assenza G, Valente AM, Geva T, Graham D, Pluchinotta FR, Sanders SP, et al. QRS duration and QRS fractionation on surface electrocardiogram are markers of right ventricular dysfunction and atrialization in patients with Ebstein anomaly. Eur Heart J 2013;34:191-200. Ning XH, Tang M, Chen KP, Hua W, Chen RH, Sha J, et al. The prognostic significance of fragmented QRS in patients with left ventricular noncompaction cardiomyopathy. Can J Cardiol 2012;28:508-14. Nagao S, Watanabe H, Sobue Y, Kodama M, Tanaka J, Tanabe N, et al. Electrocardiographic abnormalities and risk of developing cardiac events in extracardiac sarcoidosis. Int J Cardiol 2015;189:1-5. Demir K, Avci A, Yilmaz S, Demir T, Ersecgin A, Altunkeser BB. Fragmented QRS in patients with systemic lupus erythematosus. Scand Cardiovasc J 2014;48:197-201. Kadi H, Inanir A, Habiboglu A, Ceyhan K, Koc F, Çelik A, et al. Frequency of fragmented QRS on ECG is increased in patients with rheumatoid arthritis without cardiovascular disease: A pilot study. Mod Rheumatol 2012;22:238-42. Bayar N, Çay HF, Erkal Z, Sezer I, Arslan S, Çagirci G, et al. The importance of fragmented QRS in the early detection of cardiac involvement in patients with systemic sclerosis. Anatol J Cardiol 2015;15:209-12. Celik MM, Buyukkaya E, Ustun N, Nacar AB, Kurt M, Karakas MF, et al. Relation of fragmented QRS to tissue Doppler-derived parameters in patients with familial Mediterranean fever. Wien Klin Wochenschr 2015;127:185-90. Bayar N, Kurtoglu E, Arslan S, Erkal Z, Çay S, Çagirci G, et al. Assessment of the relationship between fragmented QRS and cardiac iron overload in patients with beta-thalassemia major. Anatol J Cardiol 2015;15:132-6. Adar A, Kiris A, Bülbül Y, Bektas H, Acat M, Casim H, et al. Association of fragmented QRS with subclinical left ventricular dysfunction in patients with obstructive sleep apnea. Med Princ Pract 2015;24:376-81. Oner E, Erturk M, Birant A, Kalkan AK, Uzun F, Avci Y, et al. Fragmented QRS complexes are associated with left ventricular systolic and diastolic dysfunctions in patients with metabolic syndrome. Cardiol J 2015;22:691-8. 1 Fragmentation of the QRS complex: the latest electrocardiographic craze?